My AZ Lawyers has prov ided exceptional legal services to clients throughout the Phoenix Metro Area. My AZ Lawyers offer payment options and plans in order to make your legal representation affordable. Clients in the Phoenix Metro Area have turned to My AZ Lawyers to help them gain back control of their financial problems, and eliminate debt worries, and stresses in their lives. My AZ Lawyers will fight for your rights, represent you with your best interests in mind, and help you to achieve your financial goals. 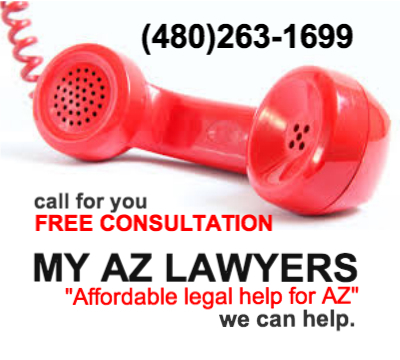 Call My AZ Lawyers to schedule an appointment to discuss your case with an attorney. My AZ Lawyers offers FREE initial CONSULTATIONS in order for you to get your debt relief started. The attorneys and staff with assist you all the way through the process of filing your bankruptcy. CALL (480)263-1699 to schedule an appointment on the phone or at the office.